Diego Tinoco, Julio Macias, and others wear black high top Converse All Star “Chuck Taylor” sneakers in the series. Ronni Hawk wears optical white Converse All Star “Chuck Taylor” high top sneakers in the series. Monse and Olivia quickly form a bond, but trouble arises from their feelings for Cesar. Over the past few years, Netflix has become a real powerhouse in the world of TV production, with new Netflix Originals premiering what seems like every day. However, with this vast quantity of content, many subscribers have noticed that there is a greater disparity in quality than in the network’s early days. For every Stranger Things and Daredevil, there’s an Insatiable and Iron Fist. Every now and then though, a special show comes along that captures the attention of a large swathe of people and hits home like no show before. Premiering in March of 2018, On My Block is a half hour, coming-of-age Netflix Original that follows the lives of four teenage friends living in Los Angeles. Touching on the themes of friendship, gang violence, puberty, race, and family, the show has touched many Latin and African Americans who relate to the strong teenage characters. Cesar has a very special bond with his older brother Oscar, which leads him down a path he never wanted to travel. The show centers around a group of four childhood friends: Monse (Sierra Capri), Cesar (Diego Tinoco), Ruby (Jason Genao), and Jamal (Brett Gray). The group is on the precipice of entering high school, when Ruby’s brother tells them that no matter what, they have to stay together because the bond they have is special. We then cut to the end of the summer, and Monse has just returned from camp where she quite rapidly went through puberty. She soon learns from Jamal and Ruby that Cesar has both joined his brother Oscar’s (Julio Macias) gang and been spreading rumors that he and Monse hooked up before she left for camp. They say he refused to take it back so he’s dead to them now. Monse confronts Cesar about this, but this reveals that they actually did hook up before she left and they had agreed to keep it quiet for the sake of the group. Cesar says he had to say it in order to keep the member of Oscar’s gang from going after her, and that he hopes that they can actually make this a relationship. Monse denies him though, fearing that it would tear the group apart. Oscar is the big man in Freeridge, and runs its most notorious gang. The gang soon gains a new member when a girl named Olivia (Ronni Hawk) moves into Ruby’s house after her parents are deported. Ruby immediately falls in love with her, but she starts having feelings for Cesar. This creates quite the love rectangle between Olivia, Ruby, Cesar, and Monse. This is a pivotal plot point for the first season, as is Jamal’s search for the long rumored, buried treasure that was hidden somewhere in Freeridge in the 1980’s by a group of cholos after they robbed a place called Rollerworld. After Cesar is initiated into Oscar’s gang, the group turns their focus into getting him out of it. Monse thinks that they should make him disappear, Ruby thinks he can talk him out of it, and Jamal believes they can use the Rollerworld money to pay off the gang. This leads to the climax of the season, where the groups interconnected lives lead to one of the best cliffhangers on television in a while. When yuppies in Brentwood want to dress like they’re from The Ridge, they wear chucks. The show is set in the fictional city of Freeridge, which is located in the Greater LA area, so there are plenty of people wearing Chuck Taylors. We see Cesar, Olivia, and Spooky all wear chucks through multiple episodes, while there are also countless background characters wearing them as well. 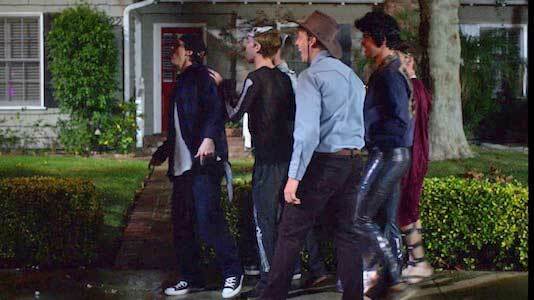 There’s even a scene where the gang goes to Brentwood and attends a party thrown by a group of rich, white teenagers. One of the kids at the party dressed like a cholo from Freeridge, wearing chucks and a plaid button up. The scene ends with Olivia dumping the kid’s mom’s organic fruit juice that she’s using for a cleanse, and that paired with chucks might be the most LA sounding scene ever. The series was quickly picked up for a second season, but no release date has been announced. This has left fans on the edge of their seats as they await the outcome of season one’s shocking cliffhanger. On My Block is an amazing show filled with strong performances from a young cast, and incredibly well developed and relatable characters. With only ten 30 minute episodes in its first season, it’s an easy show to binge watch, and is one you won’t be disappointed in. Cesar has to make the most important decision of his life.